Sebastian Giovinco's beef about the playing surface at BMO Field appears to be legitimate. 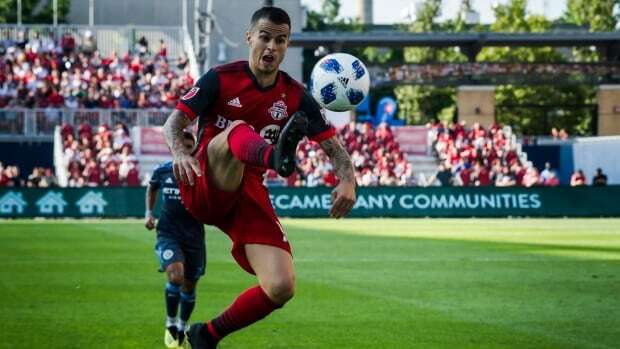 The Toronto FC star, who has made his thoughts on the subject known in the past, complained on the weekend about sand put down on the turf — and the fact that the MLS team shares the stadium with its USL affiliate Toronto FC 2 and the CFL Argos. "Every game we lose a player [to injury]. This is not possible," the Italian striker said in English. Asked Monday about Giovinco's comments, Toronto coach Greg Vanney was more diplomatic. But he acknowledged that the new grass surface laid in late May did not have as much time to settle in as originally expected because of a D.C. United game that was rescheduled to June 13 because of CONCACAF Champions League play. "So they didn't have enough time to do the normal levelling job that they would do," Vanney explained. "Then it became a progressive thing. As the sand continues to build up as they try to level it, it becomes more obvious and evident. And at the same time the grass is getting worn because there's a lot of use on the grass and so the sand becomes more exposed. "It's just a product, really, of kind of the whole season — us trying to play catchup with the field from the beginning of the year. That's where it's at. But hopefully as the grass will grow over the next seven, 10 days, the density of the grass will fill out a little bit and some of that sand will become more of an underbelly than exposed." Toronto had hoped to lay a new surface prior to the 2018 season but determined there wasn't enough time with the short off-season due to the MLS Cup and CONCACAF Champions League. Instead the surface was replaced during the league's break for the World Cup. Giovinco scored twice in Saturday's 3-1 win but seemed to be favouring a leg as he came off in the 72nd minute to a standing ovation. When Toronto installed the new surface, team president Bill Manning acknowledged that the MLS champions had been "playing on a little bit of a cow pasture." "You have a player like Sebastian Giovinco and the analogy I use is he's a Ferrari. But if you put a Ferrari on a muddy or shoddy field, it's not going to drive so well," Manning said at the time.